Everyone who buys an electronic board from Advanced Paintball Electronics (APE) will see the Tippinators own Josh 'Cornbread' Boiduk on the box. The remnants of Hurricane Floyd made landfall in Nova Scotia the night of Saturday November 3rd bringing with it torrential rains. Twenty foot high storm surge had washed out many roads throughout the region, winds over 90 mile per hour left more than 175,000 families without electricity. Best known for potatoes and Ann of Green Gables, the tiny east coast Canadian province of Prince Edward Island (PEI) will from now on also be known as a hotbed of scenario paintball, thanks to the highly successful Operation High Waters: The Carpathian Impasse played October 21 at Spikes 5150 in York PEI. The finals of the Atlantic Woodsball League (AWL) were played on October 6 at Overkill Sportz in Mount Uniacke, Nova Scotia. Three of the top woodsball teams in Eastern Canada battled for the 2007 AWL Championship and bragging rights for a year. The last day of summer, September 22, was the perfect day for the Summer Slam three man speedball tournament. Teams from throughout Nova Scotia and New Brunswick met at Overkill Sportz in Mount Uniacke, Nova Scotia for one more day of crashing bunkers and slinging paint before the end of the 2007 paintball season. The second event, of the three event inaugural season, of the Atlantic Woodsball League (AWL) was played at Mersey Road Paintball on September 15th. The Tippinators improved their season record to 4-0-0 after hard fought battles with the Milsim Maniacs and Mersey Mercenaries. The Tippinators are very fortunate to have been able to extend their record against two very skilled teams comprised of the best woodsball players in the region while playing back to back games to start the day. The third annual "Bustin Balls for Charity" presented by Mersey Road Paintball, Q104.3FM, M&M Meats of Dartmouth and the Tippinators Paintball Team was held on August 26 at Mersey Road Paintball in East River Nova Scotia. The weather forecast calling for driving rain and thunderstorms kept many players away from the event but those 100+ hearty souls who attended were rewarded with warm sunny skies after the ominous black clouds moved out early in the day. The Atlantic Woodsball League (AWL) the first ever woodsball league in Eastern Canada, patterned loosely on the highly successful Special Ops, Scenario Paintball Players League kicked off on August 25th. Three teams took to the mud soaked field at Overkill Sportz, Mount Uniacke, Nova Scotia for what all in attendance proclaimed to be, "a fantastic day of paintball". Tippinators help defend Strudleburg at the much anticipated Warriors in the Woods V: Operation Rhino presented by Banshee Paintball was held at Mersey Road Paintball in East River Nova Scotia on May 6th 2007. Every year players expect bigger and better Warriors in the Woods event than the year before. Constantly striving to exceed player expectations, Eric Fisher and Jennifer Washtock from Banshee Paintball, put on an extensively planning and meticulously prepared event that lives up to players' expectations. In only a few short years, Warriors in the Woods has become the premier scenario even in Eastern Canada drawing players and teams from throughout the Maritime Provinces. The Halifax GT, considered the unofficial start of the outdoor tournament supair season in Atlantic Canada was played on May 26th. Twenty teams from throughout Nova Scotia and New Brunswick who merged on Overkill Sportz in Mount Uniacke Nova Scotia for the first event in the Golden Triangle paintball series for 2007. 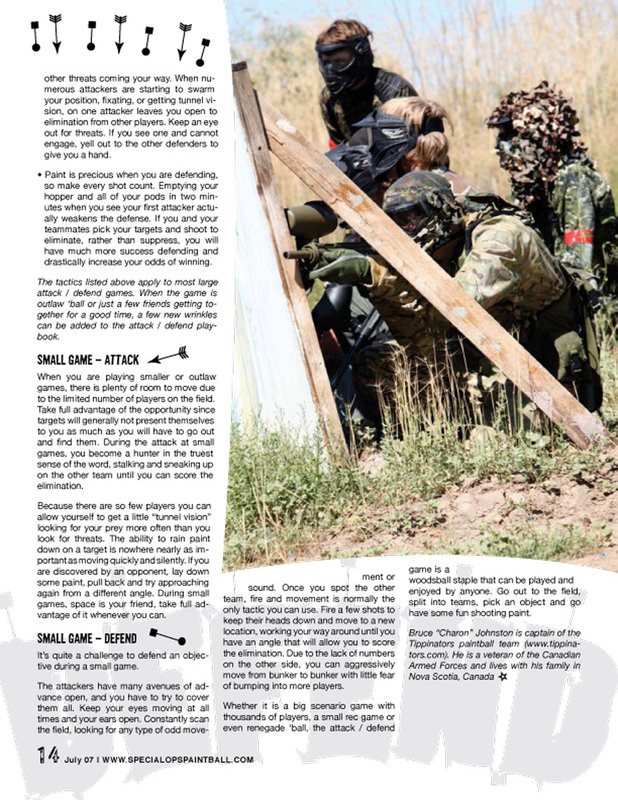 Tippinators Team Captain Bruce 'Charon' Johnston and Reserve Member Dawn 'Editor' Allcot both have bylines in two prestigious paintball magazines this month. The August 2007 issue of Paintball Sports Magazine features a game write-up by Johnston detailing the Tippinators’ adventures at Mersey Road paintball for the Warriors in the Woods V scenario. Meanwhile, the U.S.-based Allcot writes about the Long Island Big Game, which took place in New York in mid-May. There is nothing quite like the adrenaline rush of grabbing the flag and running it back to your base for the win. The sound of paintballs whizzing past your head like angry bees as you make the dash for glory or the ear to ear grin as your teammates' congratulate you in the staging area are feelings that are hard to replace. 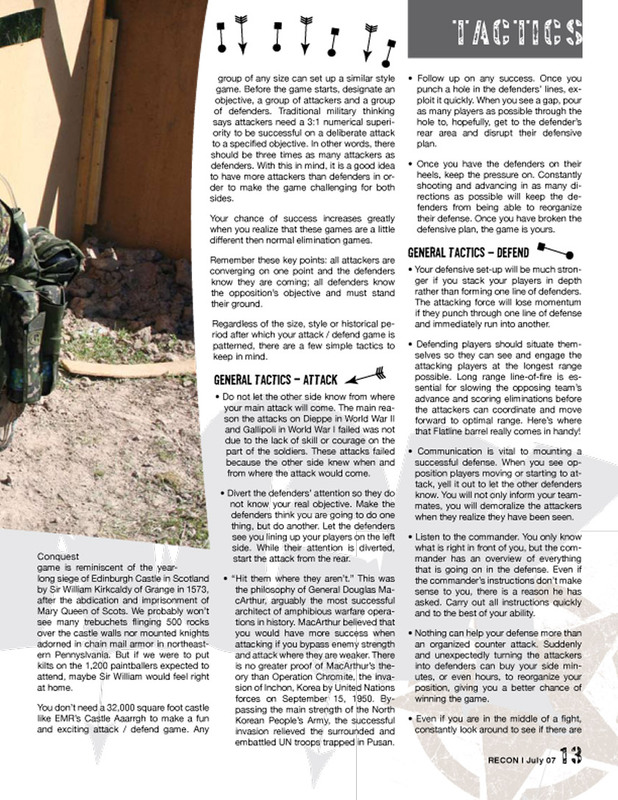 In paintball, as with many other sports, glory goes to the offense and barely a mention is made of the defense. Yet the defense can, and often does, determine the outcome of the game. Heavy mist and constant drizzle greeted the players attending the second Golden Triangle speedball event of 2007 held June 23 at Atlantic Xtreme Paintball in Moncton New Brunswick. The 17 teams in attendance were happy with the improved forecast on game day after heavy rain that had saturated the region over the previous two days. The Tippinators are well-known as a Canada-based speedball and woodsball team, but with reserve members scattered across the continent of North America, one can never be sure where the team will be spotted next. The Tippinators' Dawn Allcot traveled out to Salt Lake City, Utah to participate in the Special Ops Paintball Elite Weekend June 21st 24, 2007. As the Media Coordinator and Publicist for the event, Dawn spent the weekend hobnobbing with Tippinators sponsors and industry VIPs such as Craig Miller of DraXxuS and Erich Garbers and Dennis Tippmann Jr. of Tippmann. The Halifax GT, the first event in the Golden Triangle paintball series, considered the unofficial start of the outdoor speedball season in Atlantic Canada was played on May 26th. Twenty teams from throughout Nova Scotia and New Brunswick who merged on Overkill Sportz for the first event in the Golden Triangle paintball series of 2007. The GT kick off event was played under warm sunny skys, unlike the previous five season opening GT's in which torrential rains and cold temperatures greeted players. The great weather brought out some great paintball teams who were ready and willing to play their hearts out. Incredible slides, dives and run throughs were the hallmark of the day with every player giving it their all. When the day was done and the flag hangs counted, less then 100 points separated the four podium finishers showing the strength of the field in the rookie division. Tippinators help defend Strudleburg at the much anticipated Warriors in the Woods V: Operation Rhino presented by Banshee Paintball was held at Mersey Road Paintball in East River Nova Scotia on May 6th 2007. Every year players expect bigger and better Warriors in the Woods event than the year before. Constantly striving to exceed player expectations, Eric Fisher and Jennifer Washtock from Banshee Paintball, put on an extensively planning and meticulously prepared event that lives up to players' expectations. In only a few short years, Warriors in the Woods has become the premier scenario even in Eastern Canada drawing players and teams from throughout the Maritime Provinces. Ten members of the Tippinators paintball team piled into two cars for a 16 hour drive to attend one of the largest paintball events in eastern North America which is held in New Milford PA. The event commonly referred to as "pure paintball insanity" was Castle Conquest XXIII, held at EMR Paintball Park in New Milford PA April 27th - 28th. This year marks the 10th anniversary of Castle Conquest, run by Michael "Blue" Hanse, owner of EMR and head of "Blue's Crew". 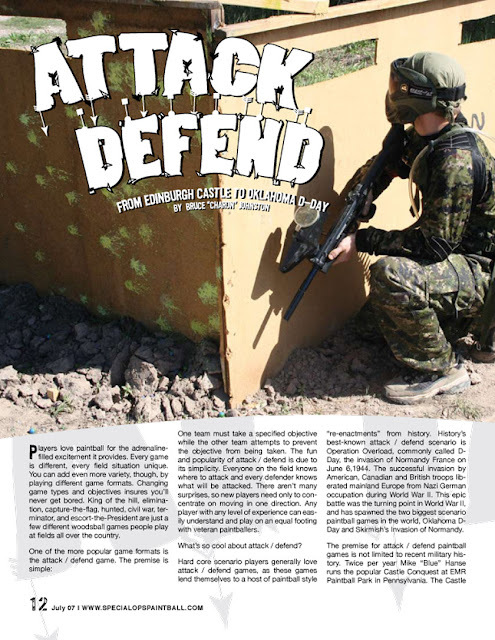 The 2007 outdoor paintball season in Atlantic Canada kicked off April 6th with the popular, 11th annual Black Friday scenario game held at Mersey Road Paintball in East River Nova Scotia. The Black Friday event, considered the start of the Eastern Canadian paintball season by most, is a unique event in that attracts players from all parts of the paintball world. After a long winter of hibernation, scenario teams can be found standing shoulder to shoulder with Xball teams. The troops along the border looked into the clear starry sky happy that the incessant rains had finally abated. It was June 22 and up to now the rain looked like it would never stop as spring still showed no signs of giving way to summer. With the miserable rain gone the soldiers could get back to doing what soldiers on guard duty do at 3:15am, thinking about when their replacements would arrive to relieve them, home, warm beds and hot meals. First Paintball Gun: Plastic Splatmaster with 12-gram CO2 in the grip and 10 rounds on top. It was almost as effective as a slingshot compared to the guns today. Current Paintball Gun: Tippmann A-5 with E-Grip, APE Rampage board, JCS double trigger, JCS Red Hot power tube, Hammerhead barrel, SpecOps MP5 mag, SpecOps A-5A2 foregrip, SpecOps Longbow stock. Seventeen teams from Nova Scotia and New Brunswick descended on the Overkill Sportz Indoor for the March Meltdown 3-Man speedball tournament, the final indoor tournament of the season. Carter Johnson, owner of Overkill Sportz, put together a fantastic event that set a new high water mark for the performance, and expectations of the Tippinators. Weeks of showing up at the field, long before the other players, and running hours of drills under the watchful eye of Coach Kevin 'Big Can' Curry paid dividends for the Tippinators. Of the two squads entered in the event, one starter division and one novice division, both finished on the podium plus there was a stellar individual performance at the Top Gun competition. Surrounded - What's Your Move? What's your move? When stupid plans are all you have left? A large pond protected us from a frontal assault. They couldn't come around to our left flank, as that route would take them right into our main line of defense. Their only option was to come through on our right, cross a road and run the tape to get around us. What's All That Stuff on your Marker? "Wow, what's all that stuff on your marker?" I have heard that question more times than I care to count. When you play with speedball with Tippmanns carrying military simulation modifications (milsim mods), players tend to notice your marker. But even on the woodsball field, the appearance of a modded-out marker can be impressive and very intimidating--especially to new players, who are usually the ones asking about my marker. The decision was easy for Curry, an elite level paintballer, to help a group of scenario players who have moved into the speedball world, "For the Tippinators to play the honest, clean paintball they do and have a small amount of success on the field is great. But if they can hold true to their team motto and start winning tournaments it will show everyone in the paintball world the way it should be done." Curry continued, "the Tipp's have had more success with sponsors then any other team in the region simply by playing paintball with heart and honor. Imagine the sponsorship success they will have if they take their game to the next level, WINNING with honor. I'd like to help them achieve that." Tipp-ing the Rift Woodsball? Speedball? To the Tippinators, it's all just paintball! "Shake hands, play hard, have fun, make new friends and remember that it is just a game." It's a good credo, and a team from Canada has swept down to spread the message to paintballers everywhere. If you see the Tippinators at a tournament, they'll be the guys wearing Digicam and tactical vests, toting tricked-outA-5s--the same set-ups they use in the woods. Like a growing number of paintballers, the Tippinators don't care what style of the game they play, just that they get to play--and make new friends in the process. Saturday January 27, 2007 marked a new day in the history of paintball in Atlantic Canada. Overkill Indoor, the first and only regulation size indoor xball field in Atlantic Canada, hosted the first tournament for 2007 and the first tournament for the new facility. Fifteen 3 Man teams from across the region converged on the Dartmouth Nova Scotia to shoot some paint, have some fun and get ready for the upcoming season.